Comfort shouldn’t be a secondary consideration when it comes to hunting. You ought to analyze both your hunting successes and failures, looking at the factors supporting or detracting from your efforts. This includes aspects such as what gear you’re using, your mental focus and toughness, and physical conditioning. You’ll be surprised to know how much effect gear has, not just on your physical capabilities, but also morale and confidence. The Eberlestock J34 Just One backpack offers amazing capabilities to hunters. Below, we’ve compiled an honest, unbiased Eberlestock J34 Just One pack review. It takes into consideration various reviews from consumers, visits to different retailers, and asking prevalent sportsmen in today’s hunting industry about the pack. It includes all that you need to know before selecting it as your hunting pack. After reading the review you’ll be able to decide whether the backpack is worth your hard-earned money. The J34 Just One is a great backpack that’s quite unique in numerous aspects. It’s capable of storing your rifles, as it has a built-in scabbard that’s simply awesome. Below are its features, clearly explained in detail. The pack can transform from a simple daypack of 2,300 cubic-inches up to 7,500 cubic-inches. It features a 2,300 cubic-inch capacity when unexpanded, weighing around a mere 7 pounds. It’s already an ultimate daypack when unexpanded. The Eberlestock J34 Just One pack’s harnesses are well-designed, having greatly shaped contours and thick padding. Its hip strap is perfectly padded to conveniently fill and fit the small of one’s back, along with nice padding on the hip-belt itself. There’s MOLLE webbing on the belt’s sides. This comes in handy, especially when you wish to attach smaller or larger accessory-pouches. The shoulder straps are quite comfortable and nicely padded, but not to the extent where they become bulky. This is inarguably useful for those who’re shooting instantly and have no time to take their pack off. The strap will definitely not disrupt you, and gives you the needed comfort. There’s a chest buckle at the center of the straps to tighten them, and adjusters at the bottom in case you wish to cinch your load once you’ve got it on. You can adjust the shoulder straps up and down, which accommodates a larger torso. You can do this by first undoing the Velcro loop, moving the strap and closing the Velcro. There’re 2 aluminum stays on the back. These can be pulled out and bent, enabling the pack to conform to your back’s shape. You’ll also find a handle at the top which you can use and grab to carry the pack around like a regular bag. Its frame system is appropriately simple, stout and comfortable. The full frame-sheet and two internal aluminum stays allow for quite a stable load-bearing platform. The top hatch features MOLLE-webbing on it, perfect for cinching things down and adding items. In case you’re completely loaded up, you can roll the MOLLE, cinch and attach a sleeping bag onto it. There’re pockets on either side of the top hatch. These pockets don’t communicate attach to another, making them suitable for separating your gear and allowing you to easily find things. They also give quick, convenient access. All its zippers are water-proof, which is definitely a great feature. There’s an opening at the top of the rifle scabbard. Although the scabbard isn’t usually extended, you can easily pull it down from the pack’s bottom. You can fit a full-size hunting rifle or tripod into the scabbard- sticking the legs inside and leaving the spotting scope mounted onto it for proper access without necessarily taking your backpack off. Once you open the top hatch, you’ll need to undo two straps in order to get to this pack’s main compartment. It’s notably all-in-one piece, having no inner pockets and tied along with a string at its top. The main compartment features a capacity of 2,300 cubic inches with the vertical front zipper closed. However, this is expandable up to 4,600 cubic inches by just unzipping the zipper. This is suitably enough storage room for a 3-4 day venture. Its main compartment is made out of mesh which sticks out through its zip opening once expanded, keeping your goods well-ventilated. 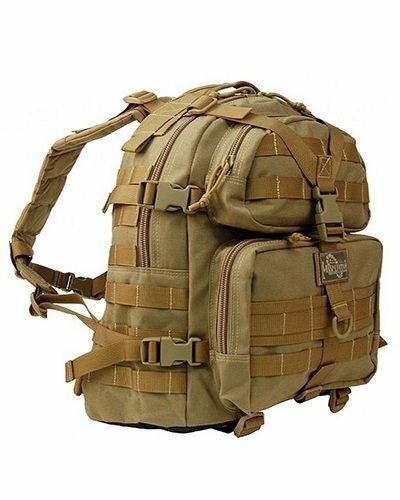 There are 2 large vertical pockets on both sides of this pack, which can fit many small items as well as larger ones such as a water bottle, tripod, scope and snacks. You’ll find an external open pocket on each side at the top of these vertical pockets. These give you quick access to your stored items. You can expand this pack even further to 7,500 cubic inches. This will, however, require you to purchase the Spike-Camp Duffel. You may also opt for the Super-Spike Duffel to allow for an 8,100 cubic inches capacity. The Super-Spike Duffel is specially designed for use with the J-series backpacks, increasing your backpack’s capacity by almost 2,900 cubic inches. It’s made of NT1 fabric, the same that all Eberlestock backpacks are made from. The Eberlestock J34 Just One pack comes at a relatively affordable price, offering high value for your money. It has compression straps to attach accessories and perfect for quieting your pack. It offers you a variety of camouflage color options to choose from: Mossy Oak-Brush, Hide-Open Rock Veil, Hide-Open Western Slope and Hide-Open Timber Veil. The J34 Just One is conveniently small and lightweight, hence highly portable. It offers a great deal of flexibility and versatility, enabling you to expand it for more capacity. Its interior is highly visible, allowing you to quickly find items. The pack features a compact design that conforms to your body. It has a center mesh meat pouch for hauling game. For more capabilities, you might be required to purchase separate accessories such as the Super-Spike Duffel. Q: Won’t the meat pouch spoil the meat? A: Among the best features of the J34 is that its meat pouch is mesh, unlike most other backpacks. This allows game to breathe as you hike out. You can be assured of enhanced storage of your freshly-killed game without worrying about it spoiling. Q: How easily can one remove their rifle? A: Ultimately, there’re quite a few backpacks on the market that have a quick-release bow carrier. All you’ll have to do is unclip the quick-release strap and reach over your shoulder to quick-draw your firearm or bow. This enables you to make quick shots. Q: Won’t the duffel bag and main compartment’s mesh sticking out ruin the camo? A: Eberlestock covers consumers in this respect. They have availed a zip-in panel which hides the mesh completely. However, it’s only available as a separate purchase. The J34 Just One pack by Eberlestock is overall a handy backpack, suitably neat and well-thought out. The variety of color options give you the choice to easily match your pack to the terrain you’ll hunt in. It’s among the most popular packs, given that it’s extremely versatile and a true example of Eberlestock’s philosophy (Go in Light- Come out Heavy). The J34 Just One is a great backpack, worth the price and offers amazing capabilities, on top of meeting all your needs. The super spike is made for use with Eberlestock J-series packs and the F1 Mainframe.